I first experienced the power of type to make the whole intellectual world readable with the same letters in the days of metal. This awakened in me the urge to develop the best possible legibility. The time soon came when texts were no longer set in metal types but by means of a beam of light. The task of adapting the typefaces of the old masters from relief type to flat film was my best school. When we came to the “Grotesk” style of sanserif, however, I had my own ideas which led to the Univers® family. Technological progress was rapid. Electronic transfer of images brought the stepping, followed by my feelings for form. But today, with curve programs and laser exposure, it seems to me that the way through the desert has been completed. From all these experiences the most important thing I have learned is that legibility and beauty stand close together and that type design, in its restraint, should be only felt but not perceived by the reader. In the course of my professional life I have aquired knowledge and manual skill. To pass on what I had learned and achieved to the next generation became a necessity. 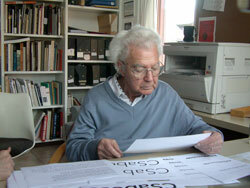 Adrian Frutiger died on September 10, 2015 at the age of 87 in Bremgarten. Please read our obituary here.